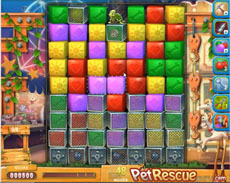 In the bottom of the screen, in pet rescue 317, there are 4 machines that protect the blocks arround them with wires. You have to destroy the two of them in the middle, using the rocket and the three bombs there are aside them. After that you have to rescue the demanded number of pets coming above the screen. Have a look on our Pet Rescue Level 317 Walkthrough video, in order to complete this level without using any payable boosters.